I was given this pattern book download in exchange for a review. I may be compensated if you click on the link to purchase this item. Once I downloaded the 50 plus crochet patterns in Handmade Holiday Crochet I was ready to make my list of all of my favorite crochet patterns to start crocheting for holiday gifts, craft fairs, and winter get-togethers for family and friends. Since many of my relatives already crochet I look at crochet patterns for items that I can donate or give to friends or co-workers who enjoy a handmade gift such as a scarf, hat, home decor item, ornament, mittens, or a warm winter blanket. Handmade Holiday Crochet offers lots of these types of crochet patterns to start making right now in order to have them completed by Christmas. Many of these are easy and fast crochet projects to complete in a weekend. In this special edition of crochet patterns you will find lots of projects both big and small to use to decorate your home or give as gifts this holiday season. There's even a minutes gift chapter for items that be crocheted in an evening or two. You will find warm toasty hats, mittens, scarves, and cowls that are not only perfect gift items but that are great items to crochet for the family to keep them warm in the winter. Especially since kids and adults always need an extra hat, scarf or a pair of mittens in the car, or at home when you may leave one behind at school or work. Decorate your home in one of the many ornaments, critters, stockings and other items to crochet in this beautiful pattern book. 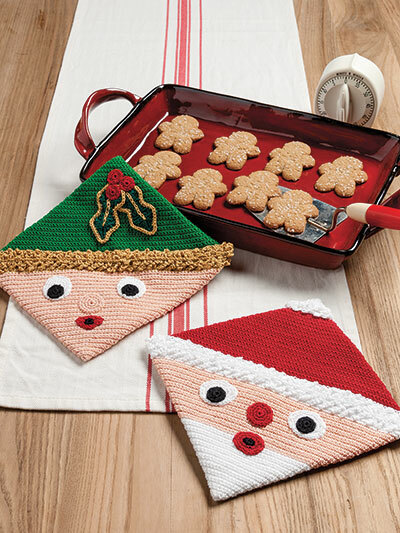 You will be sure to find dozens of great items to crochet this holiday season. 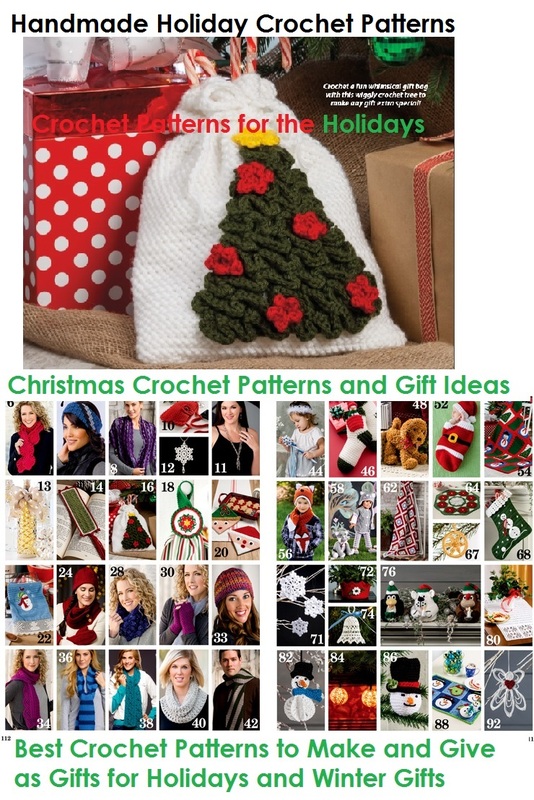 Here are a few of our favorites we are excited to crochet this Christmas for gifts from Handmade Holiday Crochet. 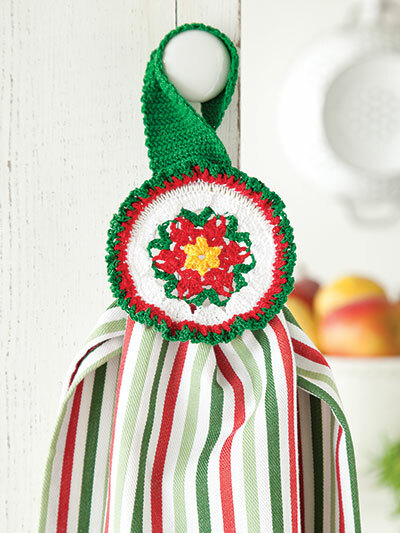 Handy Holiday Towel Topper to Crochet - Quick to Make and a practical gift to crochet. Since the gift is crocheted around a small metal ring it's easy to exchange out the towel each time. Crochet them in a variety of colors for all year round! 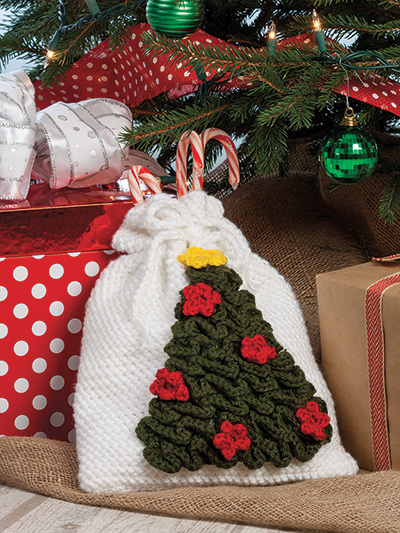 Christmas Gift Bag Crochet Pattern - Crochet a fun whimsical gift bag with this wiggly crochet tree to make any gift special! Holiday Crochet Hot Pads - Decoratively simple to make, these cute Christmas-themed hot pads are sure to bring a smile to the recipient. Fingers-Free Crochet Gloves Pattern - Pattern for Child, Adults and Pre-teens these are great for texting or wearing over a pair of gloves when the temperature drops. There are so many patterns to crochet in Handmade Holiday Crochet take a look at all of the different patterns available.